WHAT: Celebration of "Waxahachie Chautauqua Day" in Texas! The folks of the After Hours Improv are bringing back their exceptionally funny home-grown improv and will be performing to help us celebrate both Chautauqua and Comedy! Food, birthday cake, and general celebration! COST: Free to anyone! Although supporting the Waxahachie Chautauqua with a membership would be a fabulous idea - starting at just $25 per household! WHY: Texas House Bill 1254 was passed by the 85th Texas Legislature in 2017 & signed by the governor, designating July 26th as "Waxahachie Chautauqua Day" in Texas! This bill honors the first day of the Waxahachie Chautauqua on July 26, 1900 and now is celebrated each year as the birthday of the Waxahachie Chautauqua. ALSO July 26-noon - New Fire Suppression! the new Fire Suppression System for the Chautauqua Auditorium! our historic Chautauqua building and our Chautauqua heritage! ALSO: Ice cold lemonade and water and cookies! Local Girl Wins Prize in 1972. Now She Appears At Chautauqua Event! On Thurs. July 26, come hear memories of the Old Waxahachie Chautauqua from Candace Cain Ahlfinger, former PR Director for WISD and many other positions and accomplishments. 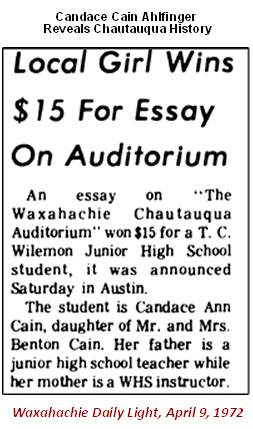 She will reveal her prize-winning 1972 Chautauqua research findings, done as a Junior Historian in WISD junior high school. During her research, Dr. Ahlfinger was able to interview Waxahachians who attended the original Waxahachie Chautauqua, before it ended in 1930. Reach back into Waxahachie Chautauqua history. The AFTER HOURS IMPROV THEATER brings their “Serious Comedy” to the Chautauqua Birthday Party on July 26. Experience their exceptionally funny home-grown family-friendly Improv performance. After recently being on hiatus, they are bringing back their popular shows this summer and we are lucky to have them as part of Chautauqua’s 2018 theme of “Comedy & Humanity”! This Ellis County-based improvisational troupe was founded by husband-and-wife team Ismael “Smiley” Alfaro and his wife, Shari. The After Hours troupe has been up and running since 2004 having started out by performing at various restaurants and coffee shops. Beginning in 2007 they performed their shows at the Texas Theater and Rogers Hotel in Waxahachie and later at the Ennis Public Theater.